John Douglas Belshaw was born in Vancouver in 1957 and raised in Burnaby. He has written extensively on the history of British Columbia and Canada, producing work for the academic and scholarly community and for the historically-minded community at large. John Belshaw examined British Columbia's first working class in Colonization and Community: The Vancouver Island Coalfield and the Making of the British Columbia Working Class (McGill-Queens, 2002), which received the Robert S. Kenny Prize for Marxist and Labour/Left Studies. As an associate professor in the Department of Philosophy, History and Politics at the University College of the Cariboo in Kamloops, he investigated why the coal miners and their families were drawn to the most remote colony in the Empire, how they coped and how they laid the foundations for the union movement of B.C. 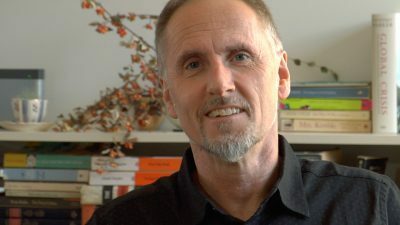 As Associate Vice-President of Education at North Island College, Belshaw revised the theory that growth necessarily equates with progress within the context of population growth for Becoming British Columbia: A Population History of British Columbia (UBC Press, 2008), with an emphasis on aboriginal depopulation. He has also co-authored Private Grief, Public Mourning: The Rise of the Roadside Shrine in British Columbia (Anvil, 2009), an exploration of the proliferation of "Roadside Death Memorials" in North America, with Diane Purvey. The authors link the erection of makeshift shrines to the dead in modern day public places to First Nations burial sites, illustrating the universality of mourning practices beyond conventional religions. In fall of 2011, Belshaw, along with Diane Purvey, published Vancouver Noir (Anvil 2011). The book examines Vancouver from the 1930s-1960s, an era in which order, conformity, structure and restrictions were considered paramount. In 2015 and 2016 he wrote two open textbooks on Canadian history for BCcampus, both of which are available free of charge to students and other readers. They are Canadian History: Post-Confederation (Vancouver & Victoria: BCcampus OpenEd, 2016) and Canadian History: Pre-Confederation (Vancouver & Victoria: BCcampus OpenEd, 2015). John Belshaw has worked as a professor in several institutions but is principally associated with Thompson Rivers University and its precursors, the University College of the Cariboo and Cariboo College. He makes his home in Vancouver's East End. Vancouver Confidential, editor (Vancouver: Anvil Press, 2014). Colonization and Community: The Vancouver Island Coalfield and the Making of The British Columbian Working Class, 1848-1900 (Montreal & Kingston: McGill-Queen's University Press, 2002). John Belshaw and Diane Purvey's best-selling history of trouble in the Terminal City, Vancouver Noir, 1930-1960(Anvil $25) is being helped along by growing interest in the era. The Arts Club Theatre Company production of Helen Lawrence: Vancouver Confidential -- a visually ambitious production evocative of film noir created by artist Stan Douglas [see D is for Douglas] and screenwriter/producer Chris Haddock - has completed its run at home and is now preparing for a world tour. Similarly, the success of Aaron Chapman's Liquor, Lust, and the Law: The Story of Vancouver's Legendary Penthouse Nightclub (Arsenal $25) and writer/producer Stevie Wilson's short documentary on the Dirty Thirties, Catch the Westbound Train (2013) feed a local appetite for stories from mid-century Vancouver. Wilson, Chapman, Belshaw, and Purvey are among fourteen authors and artists contributing to a forthcoming collection of new histories from the Sam Spade-era, Vancouver Confidential (Anvil $20).